… but I was cramming right till the end! I bought Oh Fransson’s perfect zip bag pattern and made these from 5am to 10am on Friday morning after I’d been awake from 12am. I mention this because I made a ton of mistakes while I was sewing! First, I couldn’t quite understand how I was supposed to make a 7 inch zipper work with an 8.5 inch wide piece of fabric. Even with half inch seams, that leaves a quarter inch gap on each side, right? I had already cut down my zippers and sewn on the fabric ends by the time I was having trouble, so I took the ends off and sewed them back on with space on the ends to make them longer. Also, since I like to chain piece, while I was putting together the zippers, I also sewed together the lining pieces, even though (when I’m awake I know that) I’m not supposed to do that when the bag has a zipper. Doh! 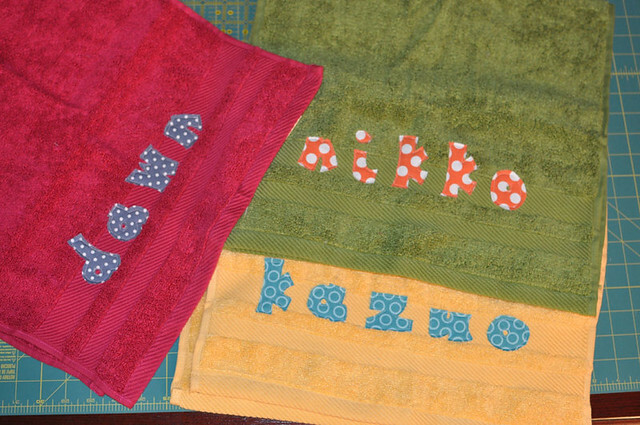 The thing(s) I was working on from 12am to 5am was this: stay-put kitchen towels x 6. I like them, but they were soooo boring to sew! These were also part of my secret Santa presents. My mom liked hers since Cosmo’s always pulling towels off the racks, but I’m not sure how the other recipients felt. My aunty thought it was a strange apron at first, and tried to tie it around her neck! In other news, I received an order that I’d made at Joann’s when they had their free-shipping-with-no-minimum-purchase special. I only ordered a bias tape maker and a stamp, and this is how it came! My mom told me that she likes to have a separate hand towel for Cosmo to use, and she asked me to do something so that people would know which towel is his. She also said that I may as well make one for Sunshine, since he’ll need it eventually. Then I figured while I was at it, I’d make one for my niece.